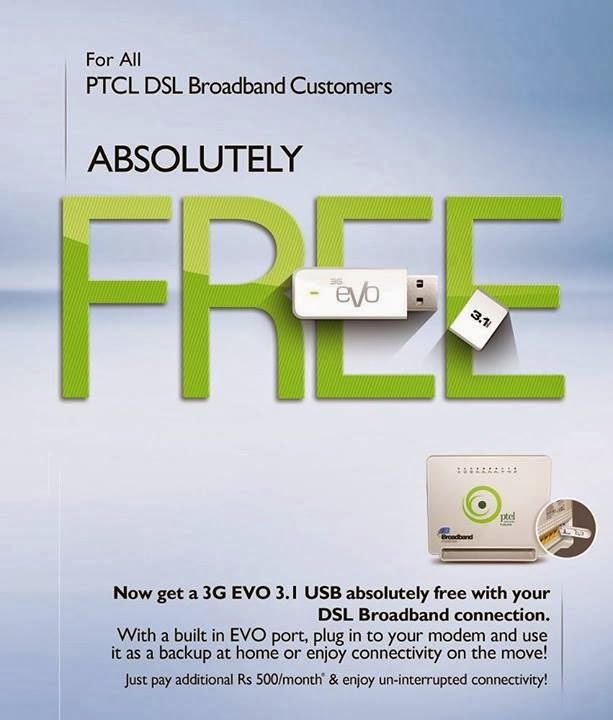 Now all PTCL Broadband customers can get an EVO 3.1-Mbps USB Absolutely Free by paying additional just Rs.500 per month. With this promotion all existing & new PTCL DSL subscribers shall be given an option to get a Free EVO 3.1-Mbps USB and pay just Rs.500 per month for EVO internet usage. The promotion can be availed by any existing or new PTCL Broadband Customer. Offer is valid for DSL subscribers only. Package can be availed with any DSL package as per customer requirement. Billing Mode will be Postpaid (PSTN Billing Only), to be billed alongside DSL in customer’s land-line bill. Rs 1,000 will be charged in case of disconnection of Evo Package on customer request before lapse of 12 months since purchase. Disconnection of Package after a period of 12 months at the request of the customer will not be charged. EVO connection will be disconnected if the PSTN connection is terminated.